Lack of bento this past week was due to complete Potter mania at our house :) Deathly Hallows *part1* came out on Friday so Thursday night Kidlet attended his first midnight showing! Normally I never would have let him since it was a school night, but one of my best buddies came from out of town so we had to! It was so much fun! This bento is inspired by Potter Puppet Pals. If you haven't seen these videos you really should, they are hysterical! And here is a celebration cupcake! The Deathly Hallows symbol is fondant and food coloring marker. The cupcake is pumpkin with cream cheese icing.....soo good! I got the recipe from Shannon @ bentolunch.net. The only change I made was using pumpkin pie spice instead of cinnamon and of course making cupcakes :) They were delicious! You're the third bento i see with Harry Potter! Cute! We went to watch the movie this past weekend too and it was a great movie! My family and I have predicted what part 2 will be like...we'll see if it'll surprise us! 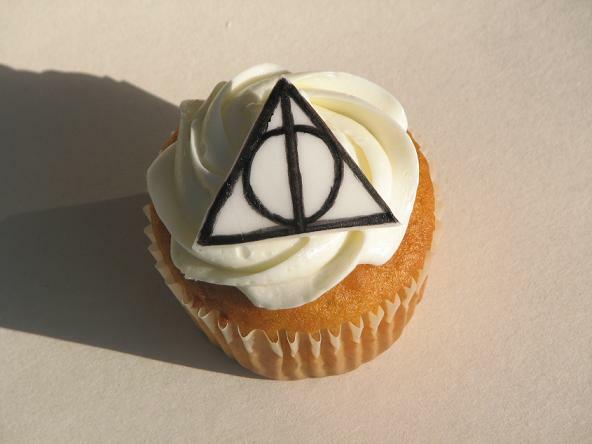 I love your cupcake with the Deadly Hallow symbol, too! Yum; I love pumpkin cake with cream cheese frosting! Delish! SO cute HP too! 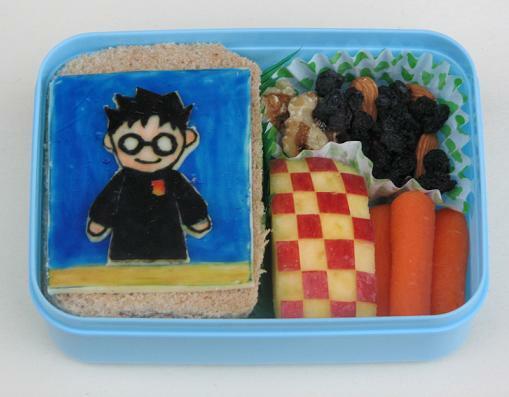 Really adorable and HP seems a perfect subject for your artistic bento approach, Jenn! Have a wonderful Thanksgiving! I have never seen lunches as cute as the ones you make. Truly inspiring!